A confession from a reasonably put together adult: clutter gives me anxiety. Not, pop a pill lay on a couch anxiety, but irritable and grouchy anxiety.� When I visit someone’s house who has every inch covered in crap I can guarantee you I won’t stay long.� It makes me feel like the walls are closing in. Now, you might think I live in a�magazine clean house. No.� That’s not living. If I lived alone maybe. But, I have a family. As much as I’m entitled to not like clutter they are entitled to not be terribly bothered by it (I don’t even know how that is possible, but, alas...) And, piles? Piles, oddly don’t bother me…as long as they’re neat and tidy and don’t take over the space, but a couple of mail piles, school work, yeah, I can deal. The advent of the minimalism movement has been a godsend. Reading books like Marie Kondo’s The Life Changing Magic of Tidying Up and watching Netflix�documentaries about Minimalism (why do those guys hug so much?) have�been eye-opening. Even the Tiny House movement is just an extension of the philosophy.� I love that we are moving towards the belief that you don’t have to have stuff to be happy and, in fact, having too much stuff makes you unhappy.� It’s choice overload.� Also, you forget what you have which leads to not valuing your belongings.� This is especially true when it comes to children and toys. We have quietly been downgrading the toy stash and aside from one instance in the last two years, my kids haven’t even noticed.� On top of that, they actually play with the toys they have. We don’t sneak everything out of their rooms. On large items or things that they liked but haven’t played with in awhile, we discuss it.� Recently, we decided to get rid of our very large bean bags.� They were not cheap.� They were the nice shredded foam-filled ones that were actually pretty comfy, but no one used them.� I thought they�might use them in the playroom or to lounge on while reading books, but they didn’t. Instead, the bean bags left a very large footprint.� When I brought up the idea of getting rid of them even my six-year-old was fine with it because he saw the value of the floor space he would gain for playing with toys that are in higher circulation. While I cannot necessarily control everything in my home the one thing that is without a doubt mine is my closet. My closet, my clothes, my stuff.� I can help my family and children weed out the unnecessary, but in the end, my husband is an adult and if he wants his stuff it’s not really my place to throw it away. Maybe it brings him joy?� Again, my children like their things.�But, I digress, back to my closet! One of the most amazing tools to�simplify my space was the discovery of capsule wardrobes.� I originally discovered the capsule concept from an Abilene, Texas blogger at Un-Fancy and the idea immediately�wormed into my brain. That lead me to Project 333 at the blog Be More With Less. So, what is a capsule wardrobe? It is a simplified wardrobe of (usually) less than 40 pieces (yes that includes shoes) that you change out seasonally. If you’ve read Marie Kondo’s organization�tome you realize it is not a simple undertaking. To take the time to spread out all your belongings, touch them and decide if they bring you joy will take a long time.� Most people who undertake a KonMarie do it in no less than a year.� That’s a lot of time.� Plus, again, the people who live in your house.� If they’re not on board you might feel a bit incomplete or cheated by the process. If they are all for it then YAY!! !, but it’s still going to take some time.� Handling your wardrobe is a great place to start because it can reasonably be done in a day or weekend and it affects no one else. Most of us actually own clothes we like and NEVER wear.� I know, weird.� When you create a capsule you are committing to just the pieces you pull for those three months.� Which means with such a limited selection you will get to wear your clothes. Or, if you don’t at the end of three months you may realize that while you like something it is not your style and you can move on. When you begin your first capsule you pull it all out.� Your clothes, that is.� If it doesn’t fit you have a choice to make: discard, donate, or store.� If it is something you love and�you think you may fit into again then, by all means, store it. If it something that has not fit you in a loooooooooong time then it may be time to get real with yourself and let it move along.� As KonMarie would say thank it for bringing you joy then say, “Bye, Felicia!” (I may be paraphrasing). Instead of one giant purge, the capsule wardrobe concept allows you to keep what you like, even if it doesn’t fit or is in disrepair.� As your season comes to an end you evaluate your pieces.� Did you wear it?� If it was one of less than 40 items and you didn’t wear it you probably won’t so “let it go.”��Is it in good shape?� If the sweater is covered in pills, the seams are ripping, you stained it then you need to decide if the item is worth fixing. Then do it.� If you can’t be bothered to repair the item then it is time to discard it. Before you really begin you can take a step back and look at the 8-10 items that are your “go to”� pieces. Which ones are already in regular circulation?� You will probably notice a theme.� Are they floral prints? Simple? Black and white? Whatever. We tend to gravitate to what we like so even though you may own a fuschia romper if you don’t wear it there is a reason.� As you cycle through a few capsules you will be removing items that you don’t wear and replacing them with ones that you do. When you decide to shop it will be with intent and you will begin to hone your style or let it emerge. You are only wearing the capsule wardrobe for three months at a time to take a risk and try something different or fun!� Throw a sequined shirt in there and see if you can dress it up and down. A big bold print dress?� Why not? If you don’t end up wearing you’ll know and if you do then you’ll learn something else about your style. As you begin figuring out what works for your style and your shape dressing will become simple and second nature.� You will start noticing which brands fit and how. Which ones just don’t. As much as you may like their clothes if the fit is off then you’ll know not to waste your time with them.� As you roll through a few you will figure out your number.� Some people do 33 items, some doe 37. If that works for you great. If you find you need 35 one month but 40 the next season then do it. You know what your lifestyle is and what it needs.� For instance. I don’t wear dresses and skirts very often. I really don’t like my thighs touching.� However, I had a lot of dresses and skirts. So, instead of putting dresses and skirts into my capsules I went through them with a keen eye and drastically reduced their number down to ones I like and fit.� It left me with about 4-5 dresses and skirts per season.� So, instead of including them I simply use garment bags to separate out my seasons and rotate them out.� Also, I didn’t have a good separate place to put long dresses so simplifying what I owned and keeping them in my closet was the most reasonable answer. Just because you are creating a capsule wardrobe does not mean you have to buy all new clothes.� In fact, if you are like most of people you have enough clothes for many seasons of clothes.� Initially, build your wardrobe around what you own. If you see a gap that needs to be filled then purchase it, but do so with intent.� This also does not mean you’ll never shop again but when you do you can invest in quality pieces that will last a long time.� Another benefit is that when you shop it will probably be for a future capsule so you can create a Pinterest Board or save it to your favorites and wait until closer to when it’s time to create your new capsule before you purchase the item.� The odds are you may not feel as strongly about it as you did with the initial rush of shopping adrenaline or it may even be on sale. Yay, sales! As you begin to really evaluate your relationship with your closet it will be like building adult relationships.� The more you do it the easier it becomes to let go of the cheap and tacky.� When you are limiting what you will be around you will want them to be items you love and are of high quality. 10. You Will Have More Happiness! Have you heard of decision fatigue? “The deteriorating quality of�decisions�made by an individual after a long session of�decision�making.” It’s the reason Mark Zuckerberg and Stever Jobs always wear/wore the same clothes each day. Well, once you have your capsule wardrobe sorted your decisions are done. It is just one more thing off you day-to-day plate.� And, when you don’t have to spend time on little decisions, like what to wear, you will be better at making decisions on more important items.� Plus, when you walk into your neat and clean closet and are, each day, greeted by a clutter-free environment on items you have hand picked to be of value – that will bring you happiness! Are you convinced? 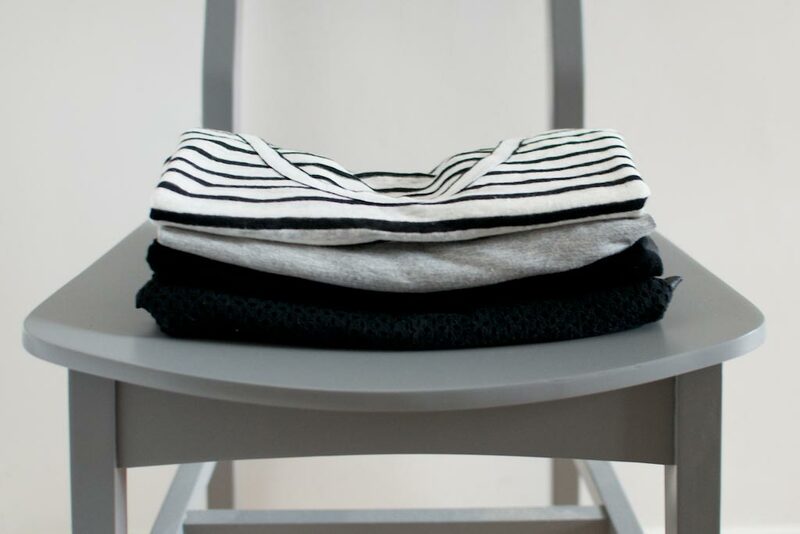 Have you tried a capsule wardrobe before? Tell us about your best tips for a successful capsule!